Use 1 scoop to 5 oz. of purified water or skim milk. ProStar Whey may also be used in pancakes, waffles, and muffins. artificial vanilla flavor, and sucralose. 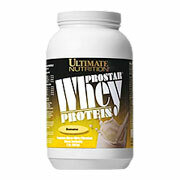 How is Prostar Whey Taken? It can be ingested in many different ways. Most commonly, it is either mixed with water or a nutritious beverage. It can be taken numerous times during the day to boost energy, but it is most beneficial if taken immediately after intense exercise. Two or three servings daily are recommended for those involved in vigorous exercise to ensure maintenance of positive nitrogen balance. This allows the body to repair and build muscle and minimize muscle breakdown. How Does Prostar Whey Boost Immunity? Whey protein is quite singular in its property to boost immunity by increasing the body's own antioxidants. In addition, Prostar Whey is blended such that the immune boosting proteins are retained, which include b-globulin, a-lactalbumin, glycomacropeptide, immunoglobulins and, among others, lactoferrin. All constituents in this category inherently boost the immune system, which does become weakened somewhat with sustained exercise regimens. How Does Prostar Whey Taste? Prostar Whey has been blended with natural strawberry and vanilla flavors to overcome the chemical taste that the amino acids normally tend to have. Importantly, its taste is the result of a complex low-temperature that utilizes proprietary refinements to capture the beneficial principles in whey. Does Prostar Whey Induce Growth Hormone? Insulin growth factor-1 (IGF-1) is the hormone released during growth hormone metabolism. The amount of IGF-1 produced is determines the extent of growth hormone on growth in general. Studies have shown that IGF-1 rises in direct proportion to the quantity and quality of protein in the diet. Hydrolyzing whey increases its biological value (please see Ultimate Nutrition's Webpage on Super Amino 2000) that, in turn, increases the release of IGF-1 making whey the best body-building protein available by far. Prostar Whey Protein Chocolate - is shipped in a discrete, unmarked package. Orders are processed immediately and usually take about 3 to 5 working days to be received. We do ask that you try it for 2 to 3 weeks to feel the full effects. Any information received is used only for order processing and shipping purposes. Your information, such as e-mail address, will never be disclosed to a third party.